TWO THOUSAND STORIES! | Keep It Up, David! The title of this post sounds like it might be a slogan for a kid’s bookstore or reading program, but actually, it represents a major milestone in my Skyscraper Collection. My Skyscraper Collection began as a tool to motivate me to use the StairMaster, which I dreaded. The idea was simple – I’m an architecture lover, so I decided to find a skyscraper somewhere on the planet equivalent to the number of stories I climbed during a StairMaster workout. The idea has worked like a charm – today I’m adding my 29th skyscraper to my collection (see the entire collection here), and this whole idea has led to two major StairMaster-related fundraising events – the first of which is happening a week from today – YIKES! Click here to read about the challenges and learn how to donate. Today I hopped on the StairMaster without any big goals. My last StairMaster workout, at the beginning of the week, was a major triumph – I shattered all my previous personal bests – and I’ve had great non-StairMaster workouts all week, so this time, I took it easier than normal. “Easier than normal” still equaled some impressive stats. I climbed for 18 minutes, burned 290 calories, and reached 76 stories. As I drove home, I realized how my training for the aforementioned fundraisers has really amped up my StairMaster standards. Three months ago, climbing 76 stories would have been a major accomplishment – a 76-story building would be the third-highest skyscraper in my collection. But, in the past 3 months, I’ve climbednine towers with more than 76 stories. In fact, 76 stories is just a few stories above myaverage number of stories per workout, which currently stands at 71 stories. If you had told me a year ago that an “easier than normal” StairMaster workout would result in 76 stories climbed, I would’ve laughed. That’s the difference that three months makes. And that’s something to be proud of. Anyhoo, time t0 add another skyscraper to the collection! Today’s skyscraper is a record-holder. It’s the tallest building in Russia and the tallest building in all of Europe – although it will lose that title in a few months, when The Shard at London Bridge opens – it’s 9 meters taller, but has 4 fewer floors. The Shard, in turn, will only hold the title until the end of the year, when the Mercury City Tower in Moscow opens – it’s 22 meters taller than The Shard, but has 2 fewer floors. The lesson is that the buildings are getting taller in Europe, but the floor count isn’t! Say hello to the 76-story Moscow Tower! Moscow Tower is on the right – it’s part of a huge complex called Capital City, which includes the St. Petersburg tower to the left, as well as a number of shorter buildings. 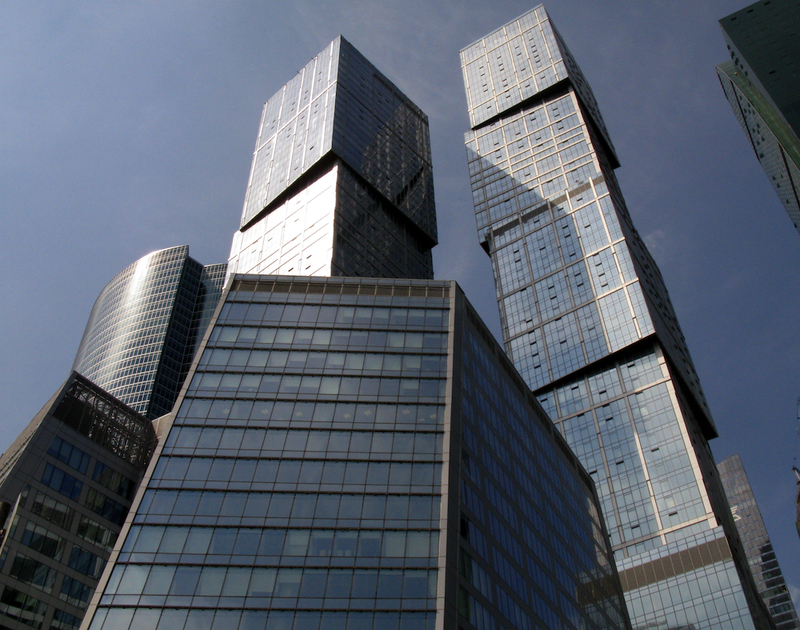 I love that both the Moscow and St. Petersburg towers have a precarious design – they look like blocks that could topple at any moment! This entry was posted on Saturday, March 24th, 2012 at 6:00 pm and is filed under Uncategorized. You can follow any responses to this entry through the RSS 2.0 feed. You can leave a response, or trackback from your own site.